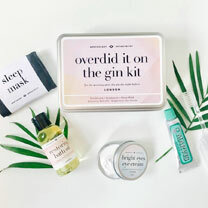 The perfect rescue kit for the morning after the gin the night before. We've all woken up feeling a bit worse for wear, regretting agreeing to that one last glass. Now you can pamper yourself out of the hangover and be back to your normal bubbly self in record time. The bath oil and eye cream included in this kit are made by hand in our in-house mix room. Sleep mask, restoring bath oil, bright eyes eye cream, toothbrush and toothpaste. Tin 14 x 10 x 3.5cm.